Black Pen Stand with Clock, Size: Height 4"
An ideal product for the workstation or study table, our manufactured marble watch with pen stand in unique in every manner. This marble product makes for an excellent gift idea and solves two purposes. The pen stand is decorated with beautiful floral and leaf motifs painted using bright colors. Both the watch and the pen stand are fixed on an elaborate marble base with intricate designs. We are leading supplier & Trader of LCD Table Clock with Pen Holder. We are basically deals in bulk quantity in Corporate gift Items. 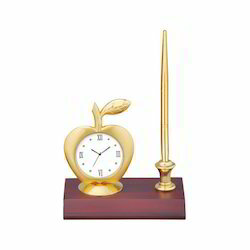 Available to the customers in a wide assortment of Gold Plated Table Clock with shapes, colors, designs and finishes the offered clock range has been designed in sophisticated and classic shapes. 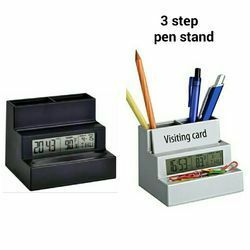 We are a most trusted name in between the topmost companies in this business, instrumental in presenting Table Clock Pen Stand.